Goodbye Norma Jeane . . .
Guillaume Faye’s speech at the 2006 American Renaissance conference was quite eventful. Most people have heard of the infamous Michael Hart incident. But to my mind, something far more significant occurred during Faye’s speech, something that later struck me as revelatory. In Faye’s view, the “Global South,” organized under the banner of Islam, is the mortal enemy of Europe. The United States, which favors the Islamization of Europe, is not the primary enemy of Europe, but merely an adversary. Faye does not, however, classify the Jewish community as an enemy or adversary of Europe at all. Instead, Faye views the Jews as a potential ally in the fight against Islamization. Thus, at a certain point in his speech, as Faye enumerated the possible negative consequences of the unchecked march of Islam, he said, “The state of Israel may cease to exist.” But, to his obvious astonishment, this statement was met by enthusiastic applause. Now, to be fair, I admit I joined in the applause too, in a spirit of pure mischief. But later I thought better of it. After all, as a friend pointed out, “If the Jews lose Israel, where do these people who were clapping think the Jews will go? They’ll all be here or Europe. Do they really want that?” I knew that, of course, and I am sure a lot of the other people clapping knew it too. But some people hate Jews more than they love their own people. They hate Jews so much that they want them to be harmed, even if it harms us too—even if it harms us more. Call it the white version of the “Samson Option.” But if we are going to think rationally about the Jewish problem, we first have to identify and isolate this strand of suicidal spitefulness, which obviously conflicts with cool calculations of how to pursue our long term racial interests. I would like to offer some notes on White Nationalism and Jewish nationalism in order to clarify my thoughts and provide material for discussion. (1) As ethnonationalists, we believe in the “Ein Volk, ein Reich” principle: “One people, one state” (at least one state per people, although there could be more than one). This means that we support, at least in principle, the nationalism of all nations, the ethnic self-determination of all peoples. We envision a kind of classical liberalism for all nations, in which each people has a place of its own, whose legitimate rights need not conflict with the legitimate rights of all other nations. If this vision came to pass, we would have a world of perpetual peace. It is an appealing ideal, even though there may be insuperable impediments to its realization. (2) Zionism is a species of ethnonationalism. It was conceived during the heyday of 19th century European ethnonationalism as a solution to the so-called “Jewish question.” The idea was to address the underlying causes of anti-Semitism by creating a sovereign Jewish homeland and encouraging a Jewish ingathering, a reversal of the diaspora. (3) As an ethnonationalist, I do not object to Israel or Zionism per se. Yes, I object to our foreign policy toward Israel and its neighbors, which is dictated by Israeli interests rather than US interests. Yes, I object to foreign aid to Israel that does not serve US interests. But let us be perfectly clear here: These are not problems with Israel per se. They are problems with the Jewish diaspora community in the United States. I do not oppose the existence of Israel. I oppose the Jewish diaspora in the United States and other white societies. I would like to see the white peoples of the world break the power of the Jewish diaspora and send the Jews to Israel, where they will have to learn how to be a normal nation. (4) But what about the Palestinians? First, let me state unequivocally that I sympathize with the Palestinians, because I too live under Zionist occupation. Second, I must also state that I admire the Palestinians, because unlike Americans and Europeans, they are fully aware that they are an occupied people. Third, and most importantly, the Palestinians are fighting against their oppressors, and I wish my people would do the same. (5) But ultimately, white interests and Palestinian interests do not coincide. Palestinians, quite naturally, want their country back. They want to send the Jews back whence they came. As a White Nationalist, I want all our Jews to go to Israel, and that means that I want Israel to stay put. What about Palestinian self-determination? I support a Palestinian homeland, right next to the Jewish homeland, because I want to send the Palestinian diaspora home as well. In short, I favor a two state solution. I do not favor the destruction of Israel, because I want the Jews to live there, not among my people. I favor a Palestinian state, because I want the Palestinians to live there, not among my people. (6) Unfortunately, when it comes to the Palestine question, the views of many White Nationalists are clouded by the fact that they hate Jews more than they love their own people, thus they are willing to beat Jews with any stick handy, including the appeal to principles that are deadly to our people as well. (7) For instance, I think it is self-defeating to oppose Zionism on anti-colonialist grounds, for the simple reason anti-colonialism undermines the legitimacy of the founding of the United States and practically every other white nation if you go far back enough. Some guilt-besotted souls have actually contemplated resurrecting the Neanderthals, presumably so they can apologize to them for the genocide allegedly committed by our Cro-Magnon ancestors. But fretting over past wrongs distracts us from something far more important, namely preventing future ones. And the most pragmatic approach is to give both Palestinians and Jews their own homelands. (8) It is also self-defeating for White Nationalists to attack Israel on the grounds of multiculturalism. Yes, some of the very same people who complain of the Jewish double standard of promoting multiculturalism in the diaspora and an ethnostate in Israel, lament Jewish-promoted multiculturalism at home while demanding that Jews adopt it in Israel! Of course the Jewish double standard is logical, insofar as it actually advances the interests of the Jews as a diaspora community and the interests of the ethnostate of Israel. But for White Nationalists, such a double-standard serves no rational purpose at all, since we do not have political power anywhere in the world, and our only hope of gaining such power is first to build a coherent intellectual case for a white ethnostate and then to build a cultural and political movement that will actually be able to take power and create one. But one cannot build a coherent intellectual foundation by appealing to contradictory principles because one’s only concern is venting hate on the internet. (9) The same argument applies to attacking Zionism because it is a form of nationalism. Since Jews have invested so much in demonizing Hitler, many think it terribly clever to liken Zionism to Nazism and Jews to Hitler. (Most White Nationalists don’t go quite that far, of course.) As a White Nationalist, however, my quarrel is with diaspora Jewry’s promotion of multiculturalism and suppression of healthy nationalism in white nations. I do not oppose Zionism because it is a form of nationalism. If Jews agree with nationalism (or National Socialism, for that matter), that is to their credit. The same argument applies to the charge that Zionism is a form of racism. I sincerely believe that a lot of the support for Israel among American and European conservatives is merely a form of sublimated white racial nationalism. That was certainly true of me when I was a conservative. So let’s leave the Jews to their racial nationalism and have our own instead. (10) It is also self-defeating to attack Israel on grounds of human rights, international law, and opposition to violence. Because everyone except complete pacifists recognizes that there are circumstances in which violence, revolution, and war are justified. Jews, moreover, have invested a great deal in promoting the idea that resisting genocide can justify pretty much any means necessary. That’s convenient, since we wish to resist our own genocide, and our enemies are not likely to give up without a fight. Any measures that Jews justified against Nazis in the past and against Palestinians today can be justified against our enemies tomorrow. (11) Since people fight more fanatically if their backs are against the wall, Machiavelli argued that it is always prudent to leave an enemy a means of retreat, as it increases the likelihood and reduces the costs of victory. Diaspora Jewry regards Israel as a refuge, an insurance policy in case things go bad. The continued existence of Israel may, therefore, make it easier for whites to combat the power of diaspora Jewish communities in our various homelands. Part of Jewish psychological intensity is their propensity to treat every issue as a matter of life and death, which produces the absurd spectacle of the leaders of the world’s most powerful ethnic group comporting themselves with the hysteria of cornered rats. The actual destruction of Israel would really give them something to whine about. It would immensely heighten the Jewish siege mentality and toughen Jewish resistance to white interests. (12) I have argued that White Nationalists have an interest in the continued existence of the state of Israel. Does this mean that European nationalists like Guillaume Faye, Nick Griffin, Geert Wilders, and Anders Breivik are justified in allying themselves with Jews, whether in Israel or the diaspora? Absolutely not, for a host of reasons. (13) The foundation of this proposed alliance is an alleged common interest of native Europeans and diaspora Jews in resisting Islam. But does that common cause even exist? After all, the state of Israel, which diaspora Jewry regards as their last line of defense, exists in a sea of Muslims. There are, moreover, millions of Muslims within Israel’s borders. Thus one has to ask: Do Muslims really make Jews feel insecure? Or, if Jews are afraid of Muslims, is there something they fear even more? Jews in Israel seem willing to exist at close quarters with Muslims to avoid a greater evil. What greater evil? European anti-Semitism, of course. The Zionist project was conceived as a refuge from European anti-Semitism. The state of Israel was founded after the Second World War. The holocaust is upheld as the justification for Israel’s founding and for all of its subsequent wars, annexations, and acts of oppression against the indigenous population. Jews definitely fear and hate Muslims. But they fear and hate white Europeans even more. Given Jewish fear of European anti-Semitism, it follows, that Jews would actually feel safer in Europe if its indigenous population were diluted with non-Europeans, including Muslims. This hypothesis is, moreover, completely consistent with the policies supported by the leading Jewish organizations, which oppose European nationalism while supporting multiculturalism and Muslim immigration into Europe. (14) But what about instances in which Jews have been attacked and killed by Muslims in Europe? Is this not a basis for a common interest in resisting Islam? I think not. Jews pursue policies in Israel that virtually guarantee Muslim terrorist reprisals. Yet Jews pursue these policies anyway, because they think they are worthwhile, even figuring in the inevitable Jewish casualties. The same logic is at work within Jewish diaspora populations. Yes, supporting Muslim immigration into Europe does expose diaspora Jews to Muslim violence. But the Jewish community regards this violence as a small price to pay compared to the benefit of the dilution and ultimate destruction of the indigenous European population. (15) Jews feel safer around Muslims than around Europeans. Jews do not, therefore, believe it is in their interests to ally themselves with European nationalists to resist Muslim immigration into Europe. But even if it were in their interest, that still might not be enough to alter Jewish policy. After all, it may be the case that Jews hate whites more than they love themselves. (16) It may be a mistake to ascribe too much rationality to Jews. Jewish power may be less a product of rational calculation than of the irrational and compulsive repetition of a set of evolved strategies for achieving dominance over other groups. If these strategies are applied compulsively rather than rationally, one would expect Jews to continue to apply them even when they are becoming counter-productive. And indeed, this has been the Jewish pattern for centuries. Jews have continually risen to positions of wealth, power, and influence. But they have a tendency to push their host populations too far, leading to sudden backlashes and terrible reversals of fortune. You can’t drive a car without brakes, and Jews have no brakes. (17) Even if Jews turned against Europe’s Muslims, Muslims aren’t the only problem. There are plenty of other fast-breeding non-white groups that could just as effectively dilute and then destroy European whites. By using “Muslims” as a politically correct proxy for non-whites, European nationalists have painted themselves into a rhetorical corner, in much the same way that American conservatives have by using “illegal” immigration as a proxy for non-white immigration. Muslims, however, can become Christians with a splash of holy water, and illegals can be legalized simply by changing the law. (18) If Jews wanted to limit Muslim immigration into Europe, they would not need small European nationalist parties to accomplish it. Virtually overnight, they could have the conservative parties opposing Muslims on conservative grounds, the liberal parties opposing Muslims on liberal grounds, the Greens opposing them on Green grounds, the socialists on socialist grounds, etc. That is what intellectual and political hegemony means. (19) Political alliances are not based merely on common interests, real or perceived. Nobody seeks alliances with powerless parties. And the European nationalist parties have little or no power. Even those parties that have achieved parliamentary representation have been unable to effect real change. European nationalist parties have nothing to offer Jews, who have real wealth and real power. (20) Why, then, do some Jews seek to join European nationalist groups, as well as White Nationalist groups in America? A variety of motives are possible, including sincere conviction, insanity, hedging, spying, and sabotage. Unfortunately, there is no foolproof way of determining what a given person’s real motives are. I’m betting that most of them are up to no good. Since we are fighting for nothing less than the biological survival of our race, and since the vast bulk of Jews oppose us, we need to err on the side of caution and have no association with Jews whatsoever. Any genuine Jewish well-wishers will understand, since they know what their people are like better than we ever can. Saving our race is something that we will have to do ourselves alone. 1. After Faye’s speech, a member of the audience stood up and asked Faye, in a roundabout way, if the organized Jewish community in France played the same role as it played in the US in opening the gates to non-white immigration. It was a fair question, one that had also occurred to me. If I had any objection, it was to the fact that the questioner was unaware of the long line of people behind him and took too much time to get to his point. Others felt similarly. Indeed, one group concluded that the incident proved it was high time for Jared Taylor to crack down on anti-Semites, the kind of people who goaded the poor victim Michael Hart until he couldn’t take it anymore. This brazen little cabal, led by Larry Auster, even framed the whole affair as the “David Duke incident,” and a lot of White Nationalists who should have known better went right along with it. Published: August 5, 2011 | This entry was posted in North American New Right and tagged articles, Greg Johnson, North American New Right, originals, white nationalism, Zionism. Both comments and trackbacks are currently closed. It was the Empire of East Rome, set up by Roman leaders after the Jews had destroyed Rome. This empire functioned in Constantinople for twelve hundred years, the longest duration of any empire in the history of the world. Throughout the history of Byzantium, as it was known, by imperial edict, no Jew was allowed to hold any post in the Empire, nor was he allowed to educate the young. The Byzantine Empire finally fell to the Turks after twelve centuries of prosperity, and the Jews have attempted to wipe out all traces of its history. Yet its edicts against the Jews were not cruel; in fact, the Jews lived unmolested and prosperously in the empire throughout its history, but here alone the vicious cycle of host and parasite did not take place. It was a Christian civilization, and the Jews were not able to exercise any influence. Nor did the Orthodox priests bewilder their congregations with any vicious lies about Christ being a Jew. No wonder the Jews want to eradicate the memory of such a culture. From the Byzantines, Pound derived his no-violent formula for controlling the Jews. Get the Jews out of education and they can not pervert the minds of the young to their subversive doctrines. Greg, at one time you told Fourmyle to cut back on his flooding of threads with huge posts repeating the same stories and arguments over and over. (Charlie Brown and the football… good grief!) He cut down for a while. It may be time for a reminder. I enjoy his commentary, but yes, when he goes on too long and repeats the same lines too much, it has the effect of leading people to tune him out. That is unfortunate. Too much of a good thing can be a bad thing. Loath though I am to engage in Board Wars, what Greg said was for me to hold it to a hundred words. No problem with that. To paraphrase Mozart, I use as many words as I need, no more, and no less. I’m sorry you saw fit to run to Greg complaining that, in effect, I am succeeding where over a century of self-identified White Nationalists have failed. I have defined the issues correctly, and do not merely complain helplessly about the Jews, which merely makes them look greater, and us look smaller. Board Wars are too common among those who are jealous of their betters. A few days back “Petronius” spoke in criticism of Chechar. I defended Chechar, on the grounds that a little revolutionary spirit helps us to move forward. I still do. As for you Joe, here’s what I have done that no one else has. I don’t just speak of the problem. I identify possible solutions in the light of a metasolution. My advice for political effectiveness draws on a good knowledge of what did not work, and why; in a nutshell, think of people who wear ununiform NSDAP uniforms, green satin bedsheets and pillowcases as formal attire, and the tragic waste of the lives of Bob Mathews and David Eden Lane, who HAD the elements of the solution, but chose instead to listen to Someone who advocated the use of force against the greatest military and intelligence power in the history of the world. I also spoke against William Luther Pierce, which seems to offend those who wish to remain in the soft, distant Past. I acknowledge the good Pierce did, and, uniquely, I identified his greatest failing, which I suspect was part of a not so grand bargain he made. Link that with Bob Whitaker’s analysis of Wordism, and you see why White Nationalism can not generate a critical mass of effective, intelligent support. And then, you see The Way Forward. If we are to transform ourselves, and the social order before us, to fulfill a metapolitical objective, we must fulfill political objectives, as the bridge from where we are, to where we deserve to be. This requires us to answer to First Question of Politics, “Why should I join you?” You can’t beat Something with Nothing, after all, and, so far, as a rule, White Nationalism has offered nothing people could really support, except for tonight’s entertainment, full of sound and fury, signifying nothing remotely effective. This Is Not By Accident. That’s because White Nationalism has identified itself by what it is against; all that what it is against has to do is change its name a little bit, and we are back to battling the Shadows created by Others. An example: If we are against the illegals, then The System says, “Fine. Make them legal. That’s that.” And the football is pulled away again, Charlie Brown. We have not been able to attract better people, with rare exception, because we can not given them something worth fighting for. We can finally do that, thanks to Harold Covington, who offers us the opportunity that scares too many of us, and that’s fine. Let Charlie Brown go back to playing Lucy’s Rules football. At night, when he’s alone in bed (Charlie doesn’t get any respect, and rightfully so! ), let Charlie Brown listen to the soft whisperings of William Pierce, telling him that it’s all THEIR fault. Let the damn Losers feel morally superior in spite of their track record of bitter, impotent failure; indeed, let them use that history of failure as proof of their moral superiority. THAT, in a nutshell, is White Nationalism (with rare exception) until Harold Covington, ALONE, realized we have always thought too small. That we have too narrow a Vision, with no real solutions, Is Not By Accident. To Greg’s enormous credit, he opened the board to a discussion of the Northwest Republic, and the supporters of the Northwest Republic won, hands down. If what we have to say “burnses” you, then think about why that is. A CENTURY of bitter failure, and I seem to be bit verbose in identifying solutions to ALL of the issues addressed in light of Greg’s analysis of the defeated who “join” us, Whitaker’s analysis of Wordism and the role of practical politics, and Covington’s Northwest Republic as an Analytical Model to frame (meta)solutions around. If I seem to be verbose, it’s because I AM identifying solutions, rather than complaining like a whipped dog about what THEY are doing to us. Again, it takes as many words as necessary, no more, no less. And you, Sir. What have you done, other than critique, without offering remotely constructive criticism? And who gains from that? Since the creation of Israel in 1948 the decline of Western Civilization has increased rapidly. The Jews now have a ‘home base’ and this has in fact made them even bolder in their sinister machinations against Whites! I side with the Amreners who clapped! I fail to see what white nationalists gain by the continued existence of Israel. More Jews live in the diaspora than in Israel and growing number of Jews wish to emigrate from Israel than immigrate to it. Our attitude toward the Jews of Israel should be one of callous indifference. The state apparatus has given the Jews the means to create a nuclear, biological and chemical weapons arsenal which they’ll gladly use against any gentile nation that displeases them. Israeli military historian Martin Van Creveld, in a weak moment, boasted that Israel has nuclear warheads aimed at every European capital in retaliation for the alleged holocaust of WWII. If we ever create an ethnostate I guarantee there will be one Israeli warhead with our name on it. Further, Israel will use its co-ethnics and proxies in the diaspora to undermine the embryonic white ethnostate especially if it refuses Jewish settlement within its borders. I believe that we are better off because 5.7 million Jews, 42% of their global population (if their numbers are to be believed) live in Israel and NOT in the United States and other white nations. Of the largest 15 Jewish communities around the world, all of them are in predominantly white nations except those of Mexico, South Africa, and Israel itself. If Israel ceased to exist, the Jewish population thereof would surely end up in countries that already have large Jewish populations, and since those are primarily white societies, the end of Israel would be VERY bad for whites. My whole point is that the diaspora is a far greater threat to white interests than Israel. Israeli Jews with nukes are FAR LESS dangerous than diaspora Jews controlling our media and politics. We need to focus our message accordingly, arguing on consistently ethnonationalist grounds that the Jews colonizing white countries need to go back to Israel. At this point, we have no power. All we have is a message, and it needs to be maximally coherent and persuasive. People who hate Jews more than they love our people get in the way of that, and they need to get their heads and hearts in the right place. What in the “continued existence of Israel” – the Zionist nation-state – for white nationalists is (1) an example that an ethnostate is possible, particularly if it is tied to a metapolitical purpose, and (2) an excuse for their continued choices of ineffectiveness, and impotence. your third paragraph makes this point better than I ever could. Van Creveld also has some fascinating analysis on the coming “collapse” of the state as we have known it. What will replace it should be the ethnostate, in our case, a Northwest Republic. Given the conditions that would solidify the formation of the Northwest Republic as a legal entity, with formal recognition from foreign countries, is an issue that will present itself, and resolve itself fairly quickly thereafter. You are sadly correct – the Israelis, and the rest of the Jews, will launch nuclear weapons, biological weapons, chemical weapons, soft weapons (economic, propaganda, demographic) all against us. What an opportunity this presents to us, as the nature of the Deep War we have been Charlie Brown in for over a CENTURY will become crystal clear, and our choices will be motivated as the reality of the Jewish policy and practice of genocide against the white race will become blindingly obvious. Look at your last paragraph, as it makes the point we have been afraid to see, and only a very few men – Bob Whitaker, Horus the Avenger, George Lincoln Rockwell, Dr. Revilo P. Oliver, Peter Shank and, especially, Harold Covington, dares say. Your last paragraph is totally fatalistic. You have been so demoralized by their incessant propaganda, as Bezmenov noted, that, like a Jew, you define the central issue we face – the future of the Race – in terms of the Jewish response. Not one word about OUR response, about the choices WE have the power to make, in response. Nothing about us actually DOING SOMETHING. How Charlie Brownish that is. How soft, weak, and helpless – a learned helplessness, at that – your comment is. How much a work of critique you offer us, without one word of constructive criticism, much less one word of how to adapt, and overcome, such obstacles, turning them into opportunities, Charlie Brown. After a CENTURY of failure, it might be time for us to return to brass tacks. “Jew,” say what you will, is a verb, and people describe The Brand Called “Jew” in favorable terms. What words do they use to describe The Brand Called “White?” Why do we allow that to be internalized in our souls? The counter to demoralization is to focus on Duty as a manifestation of Morality. Judaism is the practice of soft bullying, the elimination of other voices through dynamic silencing, and the thousands upon thousands of words they choose to define us, and the pictures they use to link the words to evoke the responses they have chosen for you. The only force the Jews fear is Christianity, the spiritual foundation of Western Civilization, and the one religion that taps into the creative Talents of the white Race. They have made their peace with the Muslims, the Pagans, the Buddhists, all other faiths, and are trying desperately to pervert Christianity into Judeo-Christianity. We have made the great mistake of being rational with the irrational, of making nice with bullies who intend for our Race to be the victims of genocide. This is the most brutal form of politics there is, and they are coming at us with Something. You can’t beat Something with Nothing, and that’s what we have been trying to do for a century. No wonder Charlie Brown always loses. Lucy’s Rules, Lucy’s football, Lucy’s as referee. We can Do Something about this, in the same manner the Jews did in creating the State of Israel, as the racial homeland for the Nation of Judea. This offers insurmountable opportunities for so many of us, so demoralized have they become. At worst they retreat into online worlds, and dream of a fantasy world – past and present – that never was. That’s tragic, but there’s nothing we can do about that, for now. The smallest good deed is greater than the grandest of intentions. They could send money to counter-currents; ten dollars a month is well within their finances. But they won’t, because they have already given up. Thus, they engage in nihilistic statements about vast transnational conspiracies, and us being the victims of Jewish atomic weapons, Jewish biological weapons, Jewish chemical weapons, Jewish every damn type of weapon weapons. Not one thought about what we can do. Thus, their elaborate fantasies – “the Jews will drop an atomic bomb on us if we move to the Northwest and form a homeland for the Racially Conscious Community!” – use a pseudo sophistication to mask the learned (and, by now, cherished) sense of helplessness fostered in us. That’s the problem, Mr. Dithers. You believe “we” can’t, and certainly, “we” never will. Rather, you never will, and that simply creates greater opportunities for the rest of us. In that example, we can learn from the Jews. In another example, we could send money to counter-currents, this and every month. Or, we could rejoice in our helplessness. The Jews certainly do. Charlie Brown. So, here’s another free suggestion. Consider using Steinbeck’s “The Grapes of Wrath” as an example of a White family’s dispossession, a metaphor to be applied in the instance of a White family in similar circumstances. What flaw in the thinking of the Joad’s can we see in our own thinking, and how can we create an alternative framework that works for us? This has been a bit more verbose than usual, because I want to emphasize that we have been taught to be sheep, and we can learn to be wolves, fairly easily. How to do that is left as an exercise for the student. I’ll define some elements of the solution in a following response. If you’ve read Harold Covington’s Northwest novels, you have all you need for a solution. If you haven’t, it’s time to put away the toys, tools and dreams of childhood. Childhood’s End is at hand, and Winter Is Coming. I agree. Unfortunately, the opposite is the case, as Hart was recently featured in AR, writing an article about NFL quarterbacks and IQ. Given a choice between Hart and Duke, who do you think AR is going to shun? It’s going to be the tall goy to be shunned, not the squat Armenoid astrophysicist. Maybe both Jews and Muslims could be allies against Chinese and Blacks. In any case, learning Hebrew and Arabic is very important. We can talk about potentially advantageous geopolitical alliances with Jews and Muslims once they have left all white nations and returned to their homelands. Not before. Jews and Muslims will anwer that Whites should leave America, Australia and Africa. This will be your last appearance here. Top-notch thinking! This piece ought to be distributed far and wide. I think that you have given the best possible explanation for why Jews promote Moslem immigration into White lands. Racism isn’t a charge, just as nationalism, tribalism, familyism, religionism, and companyism aren’t charges. The belief that racialism (loyalty to one’s race) is wicked is simply and obviously the result of Jewish brainwashing. Before the 20th century, no one ever “accused” another of racism. You have misread me. Racism is most certainly a “charge” in today’s culture. But my response is that if Zionists are racists, that is to their credit. Some nationalists propose an alliance not with Jews but with Muslims. This is another preposterous idea that routinely pops up in nationalist circles (in my experience). The theory is that nationalists and Muslims are natural allies because both oppose Jewry. The problem is that Muslims don’t care about us. What has all the many expressions of solidarity with the Palestinians ever gotten anyone? Nothing. No Palestinian leader has ever spoken out against Jewry’s anti-White agenda. No Imam, no secular leader, no Sunni, no Shite, no Sufi. No member of Hamas, Hezbollah, the Taliban, or Wahhabi royalty. None. Not expression of sympathy for White Europeans. And it can’t be because they don’t understand how Jews operate. Obviously they do. And it can’t be because they’re ignorant either. The elites in the Islamic world often are educated the West’s best institutions. The smartest Muslims no doubt understand what’s happening to Whites; clearly, they don’t care. The non-White Muslims of the middle east and Asia are nothing less than full on enemies too. The ideal scenario from the standpoint of White interests would be for Islam and Judaism to destroy each other. Thanks for pulling us back to the central issue. I have long argued that the Islam/Palestinian/Judaism/Israel conflict is essentially kabuki, stylized theater designed to build support for the status quo. Al-Jazeera’s English language channel’s linkage to what they call the Palestinian Papers strongly supports this. The ONE thing both parties can agree upon is their ultimate goal – the genocide of the White Race – period. Both parties love to keep us watching THEIR tactics, THEIR creation of the Shadows on the wall of the cave, while ignoring the strategy they all share – again, the genocide of the White Race. Sadly, we have been chosen to be rendered ineffective as the result of a century’s worth of demoralization, and yet, we still generate all of the Creative Power on the face of the Earth, and our Enemies know that. Islam and Judaism’s power come from the certainty that they are Tools engaged in the fulfillment of a destiny; one, the destiny of Babylon, and the other, the destiny of reversion back to service to God. Neither really has much use for the individual, one of the unique psychological achievements of the Christian-inspired West, and the ability that that allows, which is the creation, transformation, and reformation of relationships outside the Tribe. They both support the genocide of the White Race. All other practices go to support that metagoal, one way or the other. The genocide of the White Race should certainly provide motivation for the formation of the next White Nationalism, one that defines itself on its terms, in terms of what it is FOR. When we can define the issues of our Identity on OUR terms, to the exclusion of those who would critique us into ineffectiveness, and attack us into impotence, then we will be getting something DONE. The best counter to their religions is a better religion; the Restatement of Christianity seems to offer some assistance there. Perhaps the New Reformation might be a better term, metapolitically speaking. Incidentally, want to see what happens when White people don’t think in terms of a positive theory, and practice, of White Nationalism? Look at Rhodesia. Want to see it in microcosm? Look at Detroit. The practice is displacement, the purpose is genocide. A professor of mine, taught for few years at a University in France. Of course he remarked a certain tension between the Muslims and French students. He asked few Muslims why is that. The professor could do that as a Romanian national. One answer was amazing; a student told him that he would stab with a knife every Frenchman. All Muslims students said that the French people are cowards and hypocrites and all of them said they hate passionately the country. I don’t think that in Germany or UK the situation could be more different. Or that these countries have a “better assimilation capacity” as some neocons were bragging about years ago. 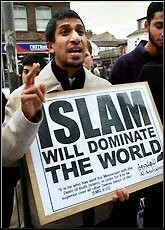 It is difficult to imagine an alliance with the Muslims based on such strong feelings. Again, there is no point in talking of alliances with Muslims who are colonizing your country. There is no interest that one could pursue with their cooperation that is more compelling than sending every last one packing. A race that needs the assistance of another race to survive is, from my point of view, already dead. Excellent and insightful piece, Greg. I’ve had very similar thoughts over the years. I remember when that gargoyle Helen Thomas spit out her anti-Israel tirade, and seemed to get at least a golf clap from some white nationalists for doing so. The Jews should just leave the Middle East, the sage Thomas insists. They should go “home.” Where is home? Well, Poland and Germany, of course. Or America, or pretty much any white country. But they should definitely leave the Middle East, presumably including any place near her own ancestral lands in Lebanon. Is such a person remotely a friend of ours? Of course not. Need I even mention outfits like Norway’s Labour Party? Sometimes the old saying that the enemy of my enemy is my friend, well, simply doesn’t work. Occasionally, The Occidental Observer has posted youtube clips of Israeli television, typically of sitcoms. I found myself watching these clips over and over again, with a certain awe and fascination. These people carved out a territorial homeland, resurrected what was a more or less dead language, fought wars for their survival. Now they create sitcoms in a not so dead language, as if it were all NORMAL, complete with air headed hosts and celebrity shows. What started out as a small group of Zionists, no doubt seen as rather weird or at least hopelessly naive by many or most of their fellow Jews, has now transformed into an actual nation, with bad TV programming and all the modern accoutrements thereof. Not that I don’t think we can do a lot better than that, but still. It was hard for me not to be impressed by all of this (not being unmindful of all of the assistance, particularly American blood and treasure, that they had at their disposal in a way that we don’t). If such a people extended the sincere hand of friendship to us, supporting us in our quest for survival as a people in exchange for our support of theirs, would it be legitimate to accept such a hand? Yes, I would have no problem with that. Bingo. This makes us, quite unfortunately, implacable enemies. As I said above, I totally understand their desire for their own nation. Yet they either do not, or pretend not to, understand my very similar desire. This makes them pathological and, dare I say it, psychopathic in nature. You also mention how, when you were a conservative, there was a certain racial aspect to your (presumably youthful) support of Israel. It was the same with me. When a liberal accuses me of being an anti-semite, I point out that I started out as a supporter of Israel. I pretty much identified with Israel as a youth, it was only later that I realized that they didn’t identify with me, and were in fact hostile to me. I look at a Jewish community in Israel and am impressed, and my natural instinct is to be happy that they aren’t living amongst my people, but also that they have a home. Yet they look at an all white community with disgust and contempt. It must be diversified, it must become multiracial. How else will these innocent white children grow up to mate with apes? In short, they return my natural benevolence with hatred and the desire to destroy. If that’s not evil, I’m not sure what qualifies. Again, the problem is with them, not with us. If the relationship is ever to be repaired between our peoples, it must start with Jews changing their ways. I won’t be holding my breath. I don’t hold out any hope of alliances between racially conscious whites and Jews, even if there are situations in which we have common interests. First, because we can’t trust them. Second, because they hate us more than anyone else, and sometimes even more than they love themselves. Third, because we are powerless and have nothing to offer them. Fourth, because if we really deserve to survive, we will have to do so ourselves. But beyond that, one cannot entertain the idea of amicable relations with an invader who is still within one’s borders. Once they go to Israel, then maybe we can talk. You’re correct on all points. I think what motivates nationalists to support Jewry is their inability to accept things as they are, rather than as they want them to be. Greg: you are right. Never trust a Jew. It now turns that none other than Fjordman probably is an Ashkenazi. An excellent analysis. Might we learn from the Jews, on how to deal with our issues, in the formation of an ethnostate? That’s what I admire about the metapolitical order, and Covington’s Northwest Republic as an analytical model. For the first time, we are not defining ourselves exclusively in terms of what we are opposed to. This is of critical importance. Are we opposed to illegals? Make them legal. Citizenship in the Nation-State is a matter of meeting the legal requirements of the Proposition, and to question the Proposition is to question the nature of the State. This becomes an unspeakable issue. Are we opposed to Jews? No, and this stops us from looking at Judaism as a process of a group evolutionary strategy, which is what makes it effective. REALLY effective. To stop us from looking at Judaism, we are told to focus on Jews, with a vague understanding of what they are doing. WHAT they are doing is the outworking of Judaism, and to look too closely might start to Awaken you. To shift us further from Judaism, we are then allowed to look at, and even criticize Zionism. Zionism has thus done its job as a lightning rod to insure a critical mass of attention is not drawn to Jews, much less Judaism. To shift us further from Zionism, we are strongly encouraged – forced, really – to LOOK at Muslims, always in a negative light. Again, we are drawn yet further from the one issue they do not want us to consider, Judaism as a strategic group evolutionary process. SO, looking directly at Judaism, we ask what is the antithesis of our Enemy’s Grand Strategy? The answer is, Christianity. Not the soft, gelded, JUDEO-Christianity we see, which has Christians worshipping Jews and Israel (WHAT?) in practice – the ultimate inversion, the ultimate control technique to keep you from looking at the knife held right to your throat. THAT takes us to Greg’s really good comment. And why do they hate the Jews so much? It’s because they have been thoroughly neutralized by a continuous process of demoralization, as Bezmenov describes. They have been so overwhelmed by the Culture of Critique, which has become the Culture of Destructive Criticism, that they have nothing worth fight FOR. Thus, “the Jews” become the all too simple target of their all too simple-minded attacks. And the Jews laugh, as we fight the Shadows they create, and control. Metzger got this right. Our (Tactical) Enemy is not the Jews. Our (Tactical) Enemy is Judaism in practice, where we accept the values and choices the Jews choose for us, and make the choices the Jews allow us to make. It is this defeatism of Spirit that must be defeated. Attacking Islamo-Fascists, Muslims, Zionists or even Jews all lead to no effect for us whatsoever, because we are always accepting THEIR Terms, THEIR Definitions, and THEIR Framing of the situation. No matter what choice we make, we can only makes choices that are good Jews, as long as the Jews control the decision-making apparatus, the Mind. This is where Covington and counter-currents wins, because, for the first time in a CENTURY (pace Dr. Revilo Oliver), we get to define the issues in terms of what is best for our Race. Thus, our (Meta) Enemy is not Islamo-Fascism, Zionism, Jews, or even Judaism. It’s whatever stops us from fulfilling the unique Racial Destiny that stands before us. Period. Full stop. If we create and fulfill the metapolitical project, Judaism will be seen as nothing more than a stumbling block that we turned into a stepping stone. A very poignant and concise take on the Jewish Question as it stands today. Well said. This Duke incident is fascinating. Less than two months ago, at Gates of Vienna all of our WN group was banned—forever. Our hideous sin? Daring to confront Fjordman on the JQ, of which he is proudly blind. Like the Duke incident, rising the JQ led to our banning even if we were always civil: it was the other side that started with the insults. After all, it may be the case that Jews hate whites more than they love themselves…. You can’t drive a car without brakes, and Jews have no brakes. How true. But I hate more the Judaized gentiles like the GoV admin and Fjordie (who claims to be of pure Scandinavian ancestry; I ignore if he’s liying) than the Jews. They are, simply put it, traitors. As a vet of the…a certain faction of…the WN movement, I was instructed early on, however, that the defeat of Zionism and Israel would disillusion the Jewish community to the point of wreaking havoc on it, encouraging abandonment thereof, assimilation, anomie and ennui, etc. I have provided an argument to the contrary. But I am open to a better argument if there is one. I am surprised, as I was when K. MacDonald did so, that you suggest an alliance with the Jews to reclaim White nationalism. For MacDonald it is one proposition among others, but for yourself, and from some of your writing, I conclude that it is a recurrent position. Denys, I cut your comment after the first paragraph, because that is all it took for me to conclude that you did not actually read my article. READ IT, then get back to me. Your right, I mostly focused on your description of zionism, as I thought opposed or different from jewish origin, and mist the last phrase of #20, where you say we should”definitly not associate with jews whatsoever”…I jumped directly to the Notes; a bit of overscroling I guess, sorry about that…you clould still put the remainder of my comment though. You could add, “Mr. Picard seem to have missread me…” or something.